If you have Iliac Crest Pain, you don't need to resort to dangerous injections or invasive surgery. You can relieve your Iliac Crest Pain by using cold compression. You can also heal the injured tissues causing the pain by stimulating blood flow. What is the Iliac Crest? The Iliac Crest is the most prominent part of the hip bone. It's the bone that you rest your hands on when you put your hands on your hips. Iliac Crest Pain is difficult to treat, because each one of three major muscle groups has the potential to have a radiating pain to a different part of the body, depending on what's been affected. Iliac Crest Pain is usually caused by a direct hit to or a fall onto the hip area. It can often be associated with or caused by conditions and injuries such as Iliotibial Band Syndrome, Piriformis Syndrome, Iliolumbar Syndrome and Hip Pointer Injuries. No matter the cause, we know your Iliac Crest Pain is debilitating and interferes with your life. We know you want to stop the pain as soon as possible so you can get back to your regular activities. We have the professional healing tools that will do just that. Our BFST® & ColdCure® Back/Hip medical devices will relieve your pain and heal the tissues around your Iliac Crest. This is the treatment you need to start feeling better today. Use the ColdCure® Wrap as much as possible to relieve your pain and swelling and protect your Iliac Crest from further injury. Do a BFST® treatment first thing every morning. Do 2 or 3 more BFST® treatments throughout the day. This will help heal the tissues surrounding your Iliac Crest. Avoid re-straining your Iliac Crest as much as possible. Using KB Support Tape will help. Giving your body a rest is hard, but it's very important in the early stages of healing. Do this and your Iliac Crest Injury can truly heal - finally. Your products are amazing and have done tremendous healing for me. I tell everyone I come across who has a need for one of your products about it and direct them to your website. I know several people who have bought multiple pieces and are as pleased as I am. You can get rid of the pain and regain proper movement of your hip. All you need is the right treatment. You need to stimulate blood flow to heal the tissue surrounding your Iliac Crest. You need Blood Flow Stimulation Therapy® (BFST®). BFST® Wraps bring nutrient-rich, oxygenated blood to your injury. This increase in blood flow works to actively heal your damaged tissues. Blood flow is the most critical element in rapid recovery. 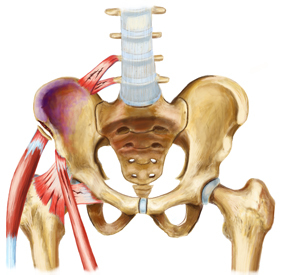 Unfortunately, an injured Iliac Crest at rest often has very restricted blood flow. While physical activity stimulates blood flow, it can also lead to re-injury and a lengthened recovery time. BFST® Wraps are the ideal solution. They're designed to speed up the healing process while you're at rest. This means you can receive the additional blood flow you need to heal and avoid re-injury at the same time. The BFST® Wrap stimulates blood flow through your Iliac Crest area while you are at rest. This is very important because while at rest, the tendons, ligaments and muscles in this area can otherwise have seriously impeded blood flow. It is the oxygen and nutrient-rich blood that enables the healing process, so adequate blood flow is required for the tissue to heal properly and quickly. This is not a traditional heating pad, it's much more! While you will feel that warming sensation while using your BFST® Back Wrap, the heat is not hot. This is because the BFST® is stimulating blood flow underneath the surface of the skin. The higher you move up in levels on the 3 Level Controller, the warmer the BFST® Back Wrap is going to feel. Does the BFST® pulse or vibrate? BFST® treatments are very pleasant and relaxing. People often notice a slight tingling sensation and warmth as the BFST® device starts increasing their blood flow. No pulsing or vibrations happen during any of the treatments. For optimal results, do 3-4 treatments per day. Since the effects of each 20 minute treatment last for about 4 hours, we recommend you spread your treatments out throughout the day. BFST® treatments should be done while you're at rest, making them the perfect time to catch up on activities such as reading, watching TV and surfing the internet. Moving up to Level 3 as quickly as possible does not increase your healing times. It will actually do the opposite. Conditioning your circulatory system, and moving up the levels when your body is ready will always give the best results. What the BFST® does, is condition your circulatory system for increased blood flow. Staying on Level 1 for one week or one month, depends on how well your body accepts the increase in blood flow. Moving up to Level 2 will only be appropriate when you can no longer feel any warmth on Level 1. Moving up to Level 3 will happen when you can no longer feel any heat on Level 2. It is very important to note that most people will never reach Level 3, or they will stay on Level 2 for a very long time. While the promotion of blood flow has obvious benefits, the reminder of the injury is also incredibly important. The reminder of the injury is what helps you move with care so you don't end up overdoing it and re-injuring yourself. Avoiding re-injury is fundamental to rapid recovery. 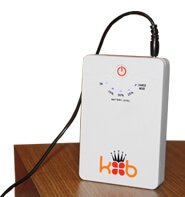 That's why we recommend that you use KB Support Tape™ Back/Hip device between treatments. This will go a long way towards shortening your recovery time. This will act as a reminder of your injury. It will also provide your sore Iliac Crest with support and protection. Healing times will vary from customer to customer, but the real key to success with your treatments is consistency. As there are so many different factors that will determine how long it will take someone to fully heal, we will never advise on timeframes. Age, severity of your injury, health and your consistency using the BFST® are all major factors that will determine how long it will take for you to heal. The one thing that we can say, is that you will heal faster by using the BFST® than without it. 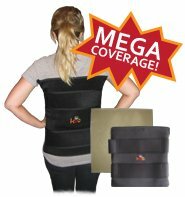 Your BFST® Back Wrap is customizable to fit around the Back and Hip's up to 52 inches. The comfortable neoprene wrap uses Velcro® to adjust the size of the Back/Hip Wrap so you can truly get that one size fits all wrap. I used the cold wraps for about a week and then last night I started with the warm wrap. Oh my goodness, what a difference it's made today. I had not hurt today, which is amazing. it's working. When I woke up today, I woke up without pain for the first time, in I can't tell you when. I love your products. Iliac Crest Injuries can be extremely painful and debilitating, causing you to rely heavily on painkillers for relief. It's important to understand that while painkillers can be helpful, they are also dangerous to take while you're active. Why are they dangerous? Painkillers completely block the pain signal, making you unaware of any further damage that you could be causing. Painkillers (anti-inflammatories) should be restricted to times of rest. Cortisone injections only mask the pain, because they are intended to help you start the healing process. This is extremely dangerous, because most people will return to their daily activities and not be cautious of your injury. This will leave you completely unaware that you could be causing further damage, until the cortisone wears off in four to six weeks. This means that unforunately you're at a higher risk of re-injury and longer recovery times overall. When it comes to painkillers, NSAIDs (like ibuprofen) are much more effective than analgesics (like acetaminophen), because ibuprofen works to relieve the pain as well as the inflammation, while analgesics will only address the pain. To maximize healing and minimize pain and swelling, complete a BFST® treatment right before bed, then take an ibuprofen-based NSAID. The BFST® treatment will work to continue the healing process while you sleep, and the ibuprofen will work to relieve the pain and inflammation, so you experience a more restful sleep. During the day, ColdCure® treatments will reduce your inflammation and relieve your pain while you're active. Use your ColdCure® Wrap any time you're experiencing inflammation or swelling and/or an increase in your pain levels. Pain is a great indicator to tell you when your inflammation and swelling is creeping up. Don't fight the pain, get ahead of it. Any time you've completed any physical activity, whether it's household chores, going for a walk, or if you're on your feet at work, it's always a great idea to use the ColdCure® Wrap to ensure that you get rid of any swelling or inflammation as soon as it starts to develop. So far I'm very happy with it. I've actually had some relief. I was having trouble sleeping and everything, and I'm starting to sleep better now. The very first step for getting rid of your Iliac Crest Pain is to treat the swelling and inflammation so you can reduce your pain levels. For controlling the swelling, inflammation and pain associated with Iliac Crest Injuries, nothing works better than cold compression. In order to be as effective as possible, the application of cold compression must be uniform and complete, and that's exactly what the ColdCure®Back/Hip Wrap provides. 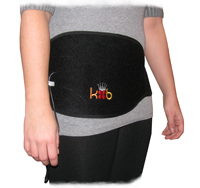 The ColdCure® Back/Hip Wrap is made entirely of very soft, stretchy material. It comes with 3 swappable cold packs that contain our unique XC RigiGel® formula. XC RigiGel® is firm yet flexible, meaning it always stays in place. Unlike gooey blue gel that migrates to other areas of the pack, our gel won't flow away from your injury. It will conform to your Iliac Crest for an even, consistent treatment every time. The gel packs are inserted inside the wrap one at a time, so you can have the other two charging in the freezer to keep your therapy going. Do your ColdCure® treatments in 20 minute intervals throughout the day, or as long as you need the relief. Your ColdCure® Back Wrap is customizable to fit around the Back and Hip's up to 52 inches. The comfortable neoprene wrap uses Velcro® to adjust the size of the Back/Hip Wrap so you can truly get that one size fits all wrap. If you are looking for mega coverage of your Iliac Crest, the ColdCure® Large Body Wrap provides exactly that. With a cold treatment area that's greater than 15"x15", you can treat your entire back or both of your hips at once! This Wrap is ideal to wear around the home and can be laid on or rested against while sitting on a couch or chair. The Large Body Wrap is like the Back Wrap, but much larger. It's a universal Wrap that can be used to treat many areas and many different symptoms. It comes with 2 huge gel packs that offer amazing coverage and cooling power. The ColdCure® Large Body Wrap is designed to fit anyone for non-back use. For use on the back it is guaranteed to fit comfortably on anyone with a waist measuring between 22" and 44". For people whose waist measures above 44", we have extensions that can be attached to your Wrap to achieve a perfect fit, (we recommend the purchase of 2 Accessory Straps for use with the Large Body Wrap). The BFST® Large Body Wrap is designed to provide Superior Coverage for your Iliac Crest Injury, when your pain is spread over large areas of the body. This is what makes it perfect to treat your Iliac Crest Injury. The treatment area is 16 inches by 16 inches making it ideal to wear around the home and can be laid on or rested against your back while sitting on a couch or chair for full back coverage. This wrap comes with 2 long detachable Velcro® straps that will help you achieve the perfect fit for anything you're treating. When you're not doing treatments with your BFST® or ColdCure® Wrap, your injured tissue becomes vulnerable to further damage. You don't want to re-injure your already fragile tissue and make your Iliac Crest Pain worse. 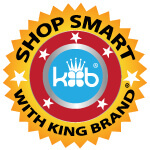 Apply KB Support Tape directly over your Iliac Crest between your BFST® and ColdCure® treatments. 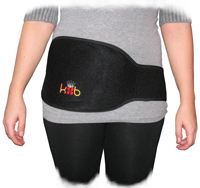 This will provide the tissue around your Iliac Crest with additional support and protection. While we found the above application to be effective for Iliac Crest Injuries, it's only an example. We encourage you to try different applications for Iliac Crest Pain to find the one that works best for you. Also, remember to listen to what your body is telling you. Use the pain as a guide. If you feel the pain in a specific area of your hip or back, apply the tape there. 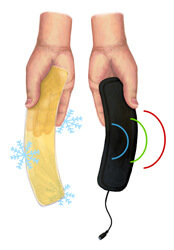 I could kick myself for not noting the name of the personable lady who solved my delima on the phone just now, but I would just like to say what a pleasure it was talking to her, and also how much I have enjoyed the relief your back heat and cold therapy has given my 87 year old back! Thank you! If you're not sure whether you're dealing with an Iliac Crest Injury, our knowledgeable Treatment Advisors can help recommend what products will best suit your pain that you're experiencing. Our team of Treatment Advisors are extremely knowledgeable when it comes to Hip Injuries and would like to help you get back on your feet as quickly as possible. We can even help create a treatment plan that works best with your schedule. We know that all of our customers have busy lives, and can't lay around waiting to heal, so that's why we offer our free professional consulting services - because we care about you. We spend all day helping people just like you recover from a wide variety of Hip and Back Injuries and we want to help you. Why do we care? We're an American Company helping American's in need. A little kindness can go a long way. You're injured, you're in pain. We get it. We want to help you get better, and not just if you purchase our products. We can provide advice if you haven't purchased our products. As a customer, you know you're ordering from a US Company and receiving a high quality medical device that will continue to work for years to come. As an American, even without buying anything, you know that you have a support team for your recovery that's available by phone 7 days a week. 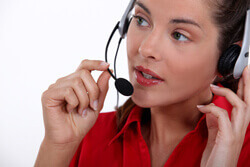 Just give us a call and we'll give you the best advice that we can. Your Checkout Includes Free Express Shipping! When you entered our site, a Back/Hip BFST® Medical Device, a Back/Hip ColdCure® Medical Device and a roll of KB Support Tape were automatically put into your shopping cart. What's in your cart now are the three things you need to stop the pain and speed the healing of your Iliac Crest Injury. By clicking on the checkout now, you will also receive Free Express Shipping on your order, which is a savings of $20. Order today, and we'll ship it today. You will receive your parcel in one to two business days from today. *The Rechargeable Battery Pack is specifically designed to work with your BFST® Back Wrap. Your BFST® Wrap comes with the components you need for treatments and to charge the Battery. For further information on whether a Battery Pack is suitable for your treatment schedule, please contact our Treatment Advisors by email or phone. Combination Therapy means using ColdCure® and BFST® in combination by alternating treatments, as well as using KB Support Tape. Combination Therapy is much more effective than using just ColdCure®or just BFST®. This is because you're getting the pain and swelling relief of ColdCure®, the healing benefits of BFST®, and the protection and re-injury prevention of KB Support Tape, resulting in the absolute best treatment for your Iliac Crest Pain. The most important part of treating your Iliac Crest Pain is to use the ColdCure® Wrap several times a day to help reduce not only any possible visible swelling you might see on the surface, but also the inflammation you may have and cannot see, deep down in the soft tissue. At the beginning, don't be discouraged that you'll be relying more heavily on ColdCure® treatments because the inflammation will continue to re-develop when you are active. Being aggressive with back to back cold treatments will give your body a chance to get ahead of the inflammation, and prepare your injury for the blood flow that's needed to help heal your Iliac Crest Pain quickly. Introduce your BFST® treatments slowly, once your swelling and inflammation is under control. Starting your BFST® will depend on how much swelling is present. It should be well under control. When doing your treatments, you should only feel a slight warming sensation. At any time if it feels HOT or uncomfortable, discontinue use as you still have too much inflammation and swelling to complete a treatment. If you are planning on being active throughout the day, complete a BFST® treatment before any type of physical activity. It can be as simple as going for a walk, or even doing the dishes depending on which type of Hip Injury you're suffering from. Always assess how you are feeling after your activity, as there's a chance you may need to apply your ColdCure® to treat any new inflammation generated during your activity. The goal with your BFST® Treatments is not to increase on the levels as quickly as possible, but to condition your circulatory system to allow for the much needed increased blood flow. Staying on the lowest level to where you feel any warmth - remember it's just a slight warmth - will be the most effective way to start healing your Iliac Crest Pain. When can you move up to the next level? You can move up in levels when you feel barely any warmth from the wrap at all. This means that you've successfully conditioned your circulation and you're ready to move up. Some people can move up in a few weeks, some people it takes a lot longer. It just depends on how well your body adjusts to the increase in blood flow. My only regret is that I did not find your website and products sooner. I have been nursing a sports induced hip injury for 5 months and could not get any improvement until I started using the BSFT and Coldcure Wrap. Only after 2 weeks I am able to get back on the tennis courts with limited play but with continue treatments looking forward to full court mobility soon. The description for my type of injury matched what my MRI showed. Your website is very educational about soft tissue injuries and easy for anyone to understand. Thanks for your products and great website. The Blood Flow Stimulation Therapy® (BFST®) Wrap is designed to promote blood flow in injured tissue below the dermal (fat and skin) layer. Utilizing our proprietary Energy Web®, specially controlled and incredibly safe, low levels of EMR energy envelop your Iliac Crest area and stimulate blood flow in the soft tissue deep beneath the skin. The resulting stimulation brings oxygen and nutrient-rich blood to the injured area, accelerating the healing process. BFST® Wraps come with a 3 level power controller. Everyone should start their treatments at Level 1 and work their way through the levels gradually as the tissue surrounding their Iliac Crest heals. Proceeding immediately to Level 2 or 3 will not speed up the healing process. You need to condition the body first. During your first treatments on Level 1, you may feel a slight warming sensation deep within your Iliac Crest. This is because, at first, your circulation is poor. The more treatments you do, the better your circulation will become, and the less warmth you will feel. This is good. As the warmth lessens from treatment to treatment, this is an indication that your circulation is improving. Better circulation means blood flow all the time, not just during treatments. This is the goal. When you feel almost no warmth during a treatment, it is time to move up to the next power level. Don't rush it though, more heat doesn't mean better treatment. In fact, less heat means better treatment, so take your time moving up in levels. The Energy Web® of the BFST® Back/Hip device is enclosed inside a soft, comfortable neoprene wrap. The Wrap molds the Energy Web® around your Iliac Crest to ensure that your tissues receive an even distribution of energy. The Velcro® strap makes it easy to adjust to find the right fit for your body shape. You don't need to remove the BFST® Wrap once your treatment ends. Simply unplug the controller and keep wearing the wrap to act as a reminder of your injury. You need to keep doing BFST® treatments even after the pain is gone, because the pain ends long before you've finished healing. The entire healing process is very complex and takes much longer than most people realize. (You can click here for the full story.) The key thing to remember is that long after the pain stops, the tissues surrounding your Iliac Crest are still healing. This means you need to continue doing BFST® treatments in order to complete the healing process. Doing regular BFST® treatments for several months after the pain is gone is extremely beneficial. Do a BFST® treatment prior to any physical activity to warm up your circulatory system. 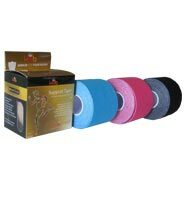 You should also continue taping your Iliac Crest area to prevent the risk of re-injury. ColdCure® Wraps are FDA Registered Class I medical devices. They exceed all government and health agency regulatory requirements for cold therapy, specifically for use in treating soft tissue injuries. When applied, ColdCure® Wraps immediately reduce the risk of further damage from excessive swelling. Doctors and Therapists agree that controlling swelling is a fundamental part of reducing long-term permanent damage resulting from soft tissue injuries. -20°C/-4°F and rapidly go to 0°C/32°F, but then their temperature will keep rising quickly, instead of staying in the safe, effective zone of 0°C/32°F. The XC Gel® danger zone is very small, but the benefits are huge. While XC Gel® packs are designed to be stored in the freezer, you can store them in the fridge if you find them too cold from the freezer. If you find that the gel is too stiff from the freezer, leave it out for 1-2 minutes before inserting it inside the wrap. This will work to soften it quickly, while still retaining maximum cold capacity. Many people use the RICE - Rest, Ice, Compression & Elevation - method when treating pain. What most of these people probably don't realize is that there are serious dangers associated with ice. The truth is that ice can actually freeze your skin and numb your nerves, causing 'cold burns' and even permanent damage to your skin and underlying tissue. The proper solution is RCCE® - Rest, Cold, Compression & Elevation. We don't want to apply ice, we want to apply cold that is just above freezing. Yes, you want cold, and lots of it - but not so cold that it is below the freezing point of water. XC Gel® packs contain 3x more gel per lb than other products, for complete coverage of your Iliac Crest. When stored in the freezer, our XC Gel® packs have 10x more cooling power per lb than other products, for faster, more effective relief of your pain and swelling. More cooling power also means longer treatments without having to get up and switch the gel packs as often. ColdCure® Back/Hip gel packs are custom designed to mold to the shape of your Iliac Crest area. This means you always get an even distribution of cooling power over your Iliac Crest. All of our gel packs are specially designed for a specific body part for the best treatment and coverage possible. Every part of the body is shaped differently, which is why all of our gel packs are shaped differently too. This product has 100% been designed to treat Iliac Crest pain. While regular gel packs have hot and cold spots, our gel packs have an evenly balanced cold temperature. Our unique XC RigiGel® formula eliminates hot spots by distributing the cold energy evenly throughout the pack. This means your injury will receive the cooling power of the entire gel pack during every treatment. The amazing temperature-balancing power of XC RigiGel® can only be found in a ColdCure® Wrap. Note from KB WebMaster - The text below is primarily intended to assist with Google properly classifying this page content. To learn more about our products please visit our website.<br>Iliac Crest Pain can be the result of or associated with ITBS, a Hip Pointer, Piriformis Syndrome or a Gluteus Medius injury. Iliac Crest Pain affects many people. There are many symptoms of Iliac Crest pain caused by injuries to the soft tissue surrounding the Iliac Crest. Treatment for Iliac Crest injuries will cause your Iliac Crest Pain to improve and your tissue to heal. There's no doubt that to heal Iliac Crest injuries quickly you need BFST treatments. Coldcure will help with your Iliac Crest pain. You can relieve Iliac Crest Pain and an Iliac Crest injury with BFST and coldcure technology. So, if you want to heal your Iliac Crest injury quickly, you need BFST. If you want to treat Iliac Crest pain you need coldcure. Iliac Crest injury symptoms are hip pain and swelling, bruising, hip weakness, tenderness and muscle spasms. A sore hip can be helped with hip exercises although exercises won't cure all hip injuries. Some Iliac Crest injuries require Iliac Crest surgery. This may heal the injured Iliac Crest tissues but the pain in your Iliac Crest after surgery can be severe. The best Iliac Crest injury treatment is BFST. The best Iliac Crest pain treatment is coldcure. These wraps are incredible. They feel comfortable. They work.